Gov. 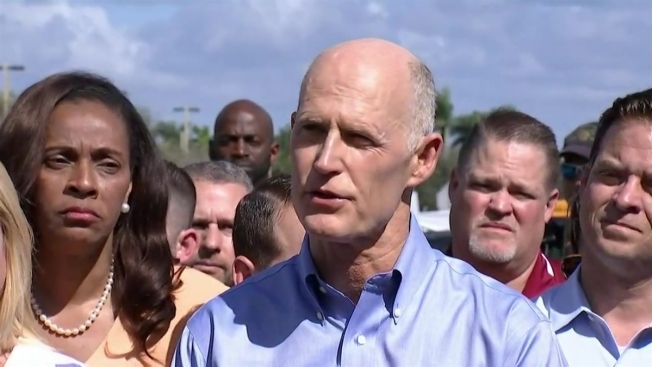 Rick Scott, BSO Sheriff Scott Israel and School Superintendent Robert Runcie spoke with the media for the first time Thursday. Officials are asking that anyone who wants to donate to the victims of Wednesday's deadly school at a South Florida high school use an official account. The Stoneman Douglas Victims' Fund, named for Marjory Stoneman Douglas High School, was created Thursday to "provide relief and financial support to the victims and families of the horrific shooting," according to the GoFundMe page. It had received just over $250,000 by 2 p.m. ET, about four hours after it was created, with a goal of $350,000. It was created to be a credible place to donate money in an attempt to prevent, Broward County Schools Superintendent Robert Runcie said. "Please keep our babies, our families and this entire community in your prayers as we go through this healing process. It's going to take quite a while," he said at a news conference, where he announced the fund had been created. Florida Attorney General Pam Bondi said she talked to officials at GoFundMe to ensure it is safe to give there. "They're pulling bad websites off constantly. They're monitoring everything," she said. Bondi also said that Florida will pay for the victims' funeral expenses. For those in the Parkland area, another way to help the victims is by donating blood, especially the universal donor type O negative. A Parkland family also has launched a site selling t-shirts with different slogans, including Douglas Strong and Parkland Strong, for $20 with all profits going to families and victims affected. To purchase a shirt, click on this link.